The term electrochemical noise is used with corrosion researches to describe nucleation processes and their elimination processes. These processes go hand in hand with low measurable electrical pulses (occurrences). It can not be spoken directly about a noise in sense of the electrical engineering (frequency composition) or also in the acoustics. Although the researches are usually analyzed within a frequency spectrum but the analytical methods are mostly statistical in nature. So for example the frequency of occurrence and also their intensity is tested and analyzed. Analysis methods are for example impulse / occurrence counting, standard deviation or evaluation in the frequency range. The special feature in the measurement of electrochemical noise in comparison to other methods of electrochemical corrosion testing is that the information gain can take place without external excitation of the system (potential noise). The high sensitivity of the measuring method allows to determine for example of passive metal surfaces the initiation of processes of local corrosion phenomena. The cause of the electrochemical noise of passive metals are the activation and repassivation processes of the passive layer respectively caused by the fluctuations of the charge at the phase boundary metal layer (passive layer) / electrolyte. Depending on the experimental setup these charge fluctuations can be measured as current or potential noise. Prerequisite for the analysis of measurement data is whose acquisition. For this particular method is special equipment with very fine resolution, with appropriate amplification factors and frequency filters needed. Especially important is also the seperation of the DC proportion of a measured signal. This proportion can be very much higher than the "noise proportion" and so the measurement and resolution of the desired signal are interfered really strong. Since here also external interference (electromagnetic fields) or respectively whose shielding can play a major role we also offer on the one hand Faraday cages and on the other hand measurement devices with battery operation. Thereby the significant interfering signals can be shielded. To execute those measurements we currently have one potentiostat in assortment. The PGU 100-PCR as a universal laboratory device with a high level of automation. The PGU 100-PCR can be used as a normal potentiostat / galvanostat as well as for the measurement of the electrochemical noise (potential and current noise). It runs with grid operation as well as battery operation (approximately three hours in battery operation). It is equipped with switchable amplifiers for the potential noise (x 100 / 500 / 1000 / 2000 / 5000 / 10000) as well as for the current noise (10 / 20 / 50 / 100 / 200 / 500). Furthermore the current measurement range can also be switched by software that implies a major flexibility. Likewise the filters are switchable in their range. So the lower limiting frequency is set fixed to 0.1Hz (0.01Hz). 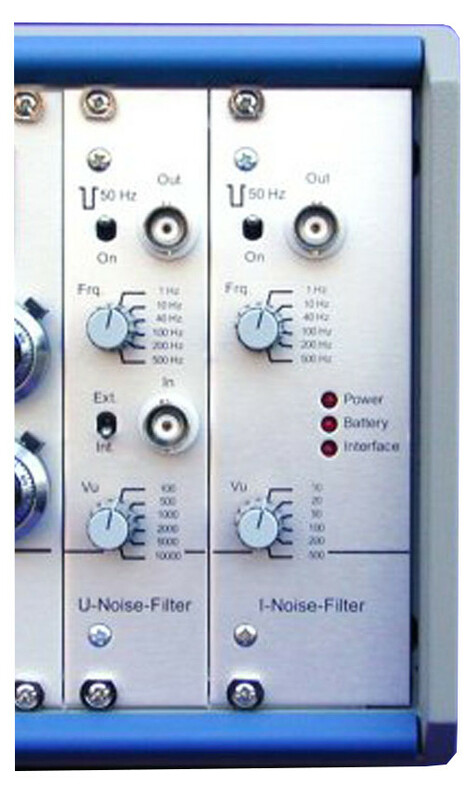 The upper limiting frequency can be switched in 6 ranges (1 / 10 / 40 / 100 / 200 / 500Hz) [see also picture noise filter unit]. The device in its modularity is already a prestage to decentralized systems whose application becomes more probable in the future. With this measurement method any two electrodes or a working electrode against a reference electrode are immersed in an electrolyte and measured against each other. The measurement is conducted without current flow that means it is only measured the potential. First the open corrosion potential adjusts itself between the two electrodes. For the measurement of the potential noise it is now important to separate this open corrosion potential (DC-component) by a high-pass filter. Then the noise signal components can be (in most cases between 0.1Hz to 40Hz) highly amplified and measured. If no noise signals (occurrences) are visible then it will be assumed that the system is in a passive state. An increase of occurrences (noise) can be reached by modification of the electrolyte that means by activating the surface(s). Similarly, a passivation can also be reached by appropriate inhibitors. For the outside currentless measurement two electrodes are connected to the (zero-resistance-) ammeter of the potentiostat and thereover quasi shorted. Due to the potential difference between the two electrodes and the conductivity of the electrolyte a current flows between the electrodes that means a charge exchange takes place. Again it is necessary to seperate the DC-component and to filter and to amplify the noise occurrences whereby here it is a current noise signal. An activation of the surface takes place by modification of the electrolyte [see also point 1.]. In addition to the upper measurement a reference electrode can be dunked into the electrolyte and the potential noise can be measured. Thereby the static potential is a mixed potential of both working electrodes. If one wants to measure the current noise under potentiostatic control then one will definitely need a three-electrode arrangement. First the potentiostat is switched to open corrosion potential (OCP) with the result that a potential between the electrodes can adjust itself. Then the system is switched to I-cell so that a current between the electrodes can flow according to the adjusted potential. Again it is necessary to seperate the DC-component and to amplify only the noise occurrences. Unlike the above methods the activity of the surface (noise initiation) can be started or stopped by a modification of the potential. It does not necessarily require the modification of the electrolyte. It should be mentioned that also other conditions as potential or electrolyte can initiate the noise occurrences such as for example the temperature. However it would go too far here to explain all this. If you want to measure the potential noise under galvanostatic control, you need definitely a three-electrode arrangement. First, the potentiostat is switched to open corrosion potential (OCP) with the result that a potential between the electrodes can adjust itself. The control unit for current are set to zero, so there flows no current while closing the circuit. Then the system is switched to I-cell. Also here it is necessary to sever the steady component and only to intensify the noise occurrences. Equivalent to the method with potential control, the control elements imprint current on the system and the noise potential is observed. The activation of the surface (noise initiation) is caused by the change of current. It does not require a change of the electrolyte. The high sensitivity of the system in this version is interesting. Already small changes in noise potential are easier to recognize than current at potential initiation. 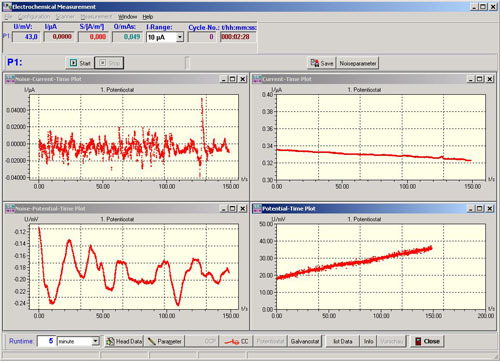 On the register tab scan-file a generator file can be deposited that automates the task of the measurement of the current noise under potentiostatic control. On the register tab parameter noise the amplification factors of the potential and current noise are adjusted. Finally on the register tab test sequence the measurement is started. Also here it can be chosen whether the nominal potential by potentiostatic control can be entered by file (automatic) or manually. The manual variant practically offers the possibility to change the nominal potential at any point in time. If no scan-file is selected (manually) then the duration of the measurement must be entered. Corresponding to the default settings the measurement values are normalized and saved as ASCII-data. The sampling can be executed depending on the measurement hardware with up to 2000 values per second with the result that all relevant noise signals can be recorded. All analysis like occurrence counting, min- / max-determination or the calculation of the rise time have to be made in the evaluation program. In the four different graphic windows the potential noise, the current noise, the latest potential and the current (raw measured values) are shown. The noise signal in the picture Noise measurement 1 shows no activity yet. In the picture Noise measurement 2 one can recognize typical noise transients that indicate a starting nucleation after the addition of chloride. The picture Noise measurement 3 shows the same noise signal in the first section as in picture Noise measurement 2. The noise signal drops practically to zero and the nucleation comes to standstill after the addition of an inhibitor. Meantime, a more intensive collaboration arised with the University of applied sciences Südwestfalen, in particular with the group of Mr. Prof. Dr. rer. nat. hablit. G. Schmitt. The goal of this collaboration is to develop industrial-suited components for the noise measurement. Thereby decentralized units that can be brought as close as possible to the measuring point with local intelligence and network connection should be built beside the existing laboratory equipment and systems. Corrosion-relevant informations should be available as fast as possible by the corresponding preprocessing of the measured values. 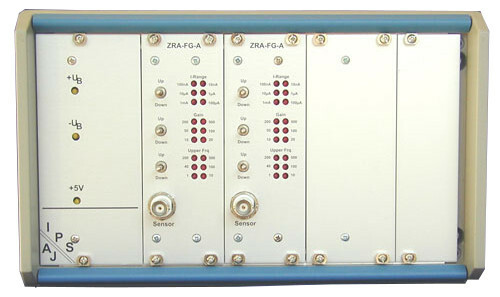 Meanwhile a 8-fold zero-resistance-ammeter for the laboratory use is available.